All year long we have been working backwards. In our genre-driven workshop, we have always begun with a genre, figured out how it works, and searched for an idea to fit it. 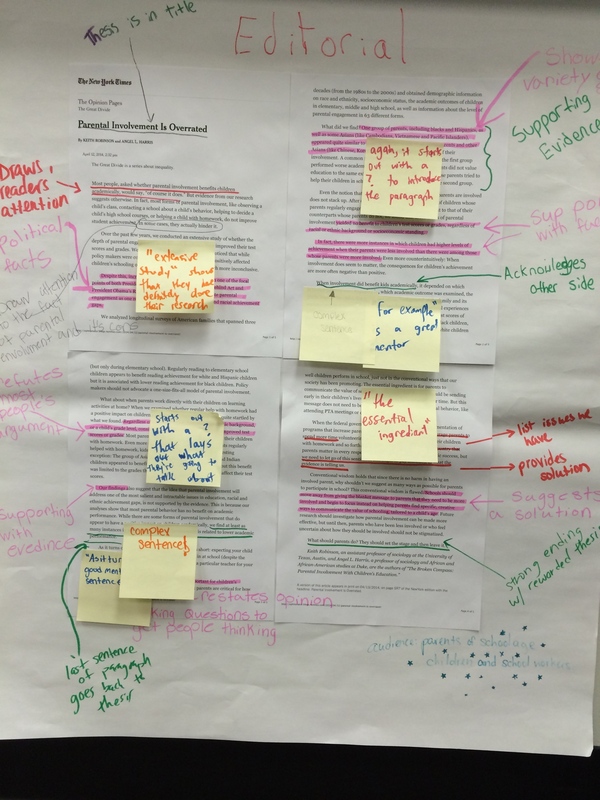 But now that my students have a command of several genres and an understanding of the varying purposes and audiences of each, they are ready to work forwards–like real writers. Rebekah wrote eloquently on this subject a few months ago, explaining how real writers chase their ideas into a genre that best suits their purpose. So our culminating workshop is not genre-driven but technique-driven. The mini-lessons focus on the technique of evidence–a literary feature indigenous to all genres. Robinson, Keith and Angel L. Harris. “Parental Involvement Is Overrated.” The New York Times: The Opinion Pages. The New York Times Company. 12 April 2014. Web. 15 May 2014. Roethke, Theodore. “My Papa’s Waltz.” Poetry Foundation. Poetry Foundation. 2014. Web. 15 May 2014. “The Science of Raising Happy Kids.” Infographic. Happify. Happify Inc. 2014. 15 May 2014. Sebold, Alice. “What Remains.” The New York Times Archives. The New York Times Company. 12 April 2014. Web. 15 May 2014. Sherman-Jones, Carol. “A Lesson Not Learned.” I Thought My Father Was God. Ed. Paul Auster. New York: Picador, 2001. 52-53. Print. Then, following Rebekah’s lesson, I assigned one text to each group of five students. 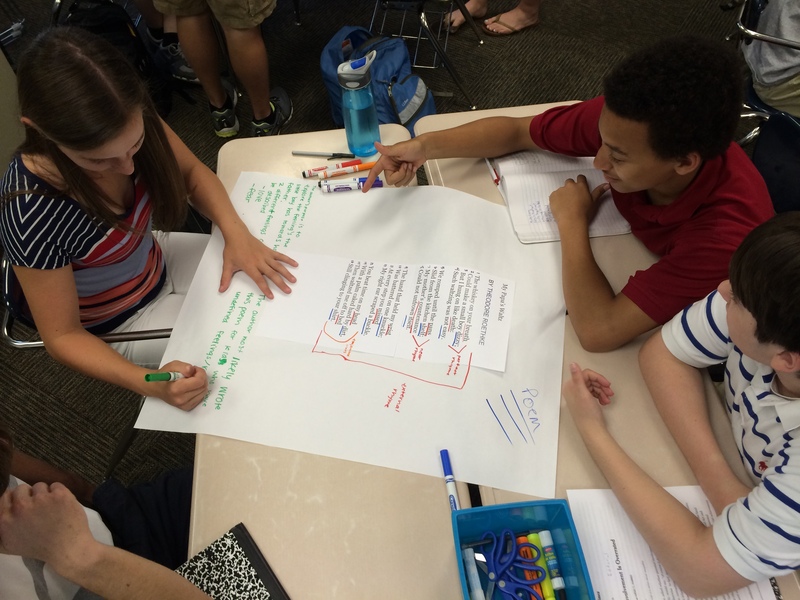 Students were directed to use their writer’s notebook to review the defining features of that genre. 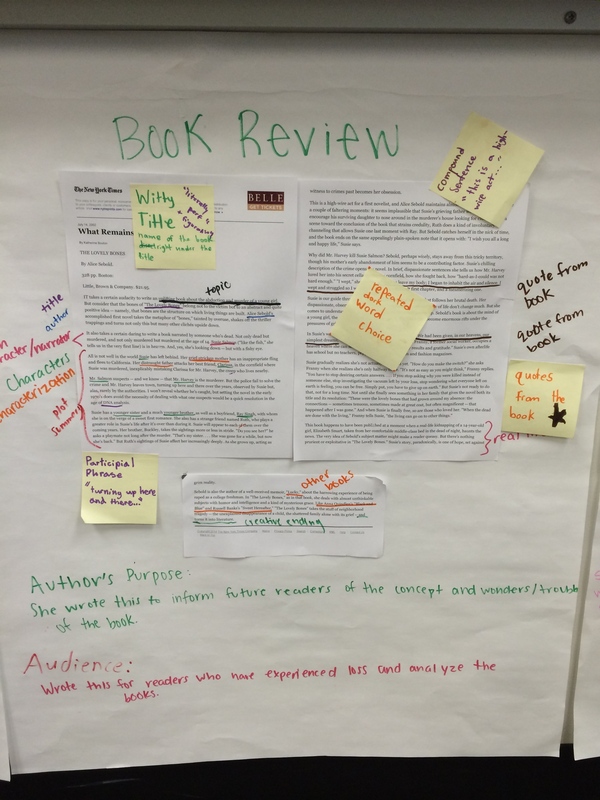 This provided a way for them to review the features of the genres they’ve been writing in throughout the year as well as see how their knowledge has grown. I knew I wanted their annotations to have a visual impact, so in addition to giving each student a packet of the five texts, I printed each “essay” in 30+ font and glued them to oversized Post-it notes. 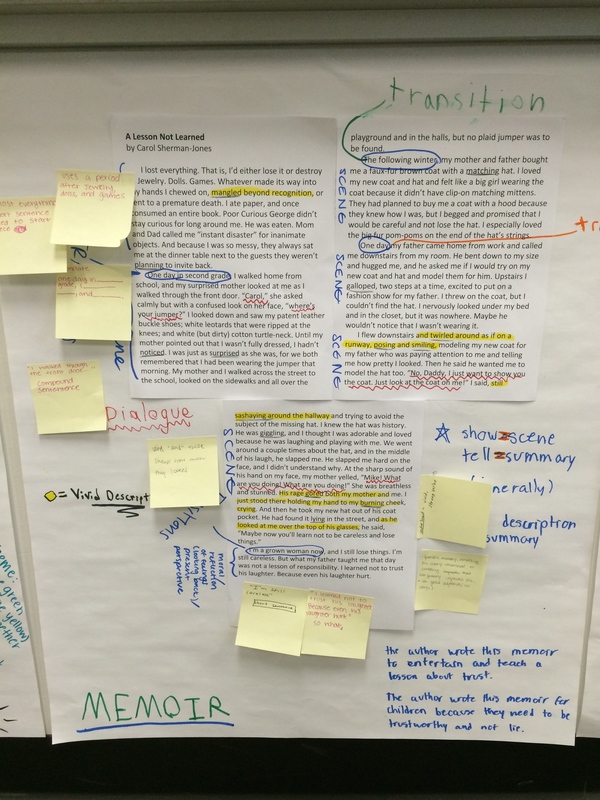 Students annotated with markers and colored pencils, color-coding different features. 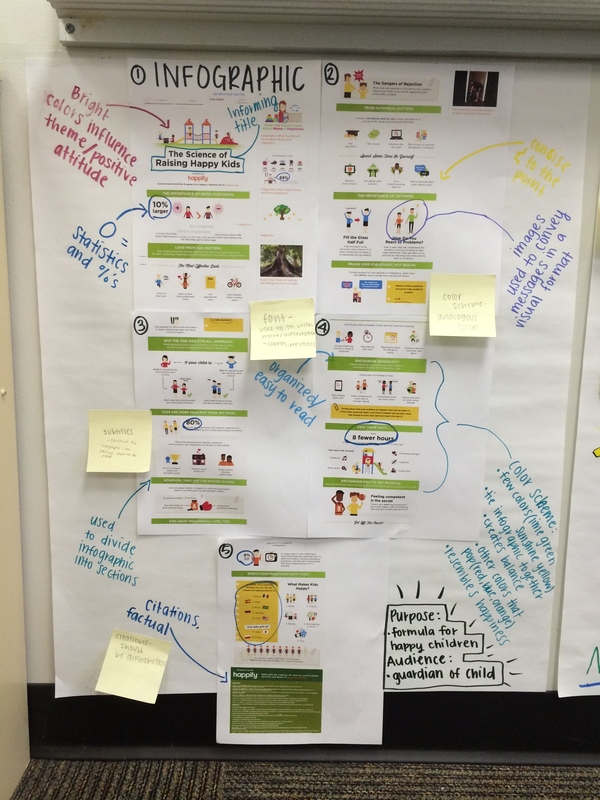 To avoid having two different sets of posters (one set from each class) teaching virtually the same thing, I used Rebekah’s layered annotations lesson to inspire some cross-class collaboration. Period 4 focused on the structural elements of the genre and Period 7 annotated for sentence-level features. 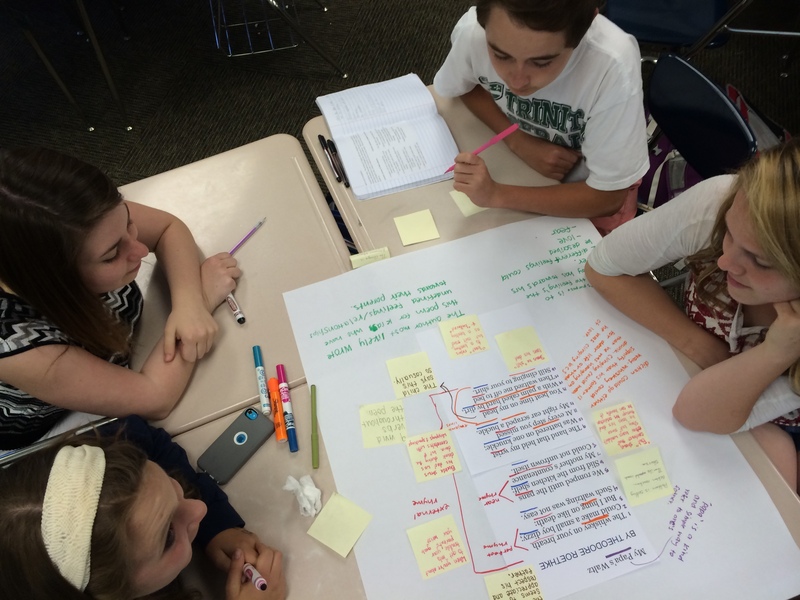 Here is a picture of the Period 7 group who annotated the same poem. They used sticky notes to differentiate their findings from Period 4’s noticings. The result is a beautiful set of anchor charts showcasing the genres (except for literary analysis) we studied this year. I hope these charts will be useful and inspiring to students as they progress through their final workshop. Thinking about how this would also work for primary source analysis in history! You could also use them to teach “timed writings” as a genre study in the AP class (you’d blow up the student exemplars).